Guests: Albert Tenuta, OMAFRA Field Crop Extension Plant Pathologist; Barry Senft, CEO of Grain Farmers of Ontario. Hosted by Maegan MacKimmie and Rachel Telford. June 29, 2018. 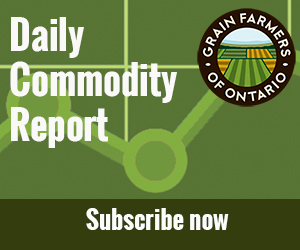 Topics: Wheat pool interim payments, FCC contributions to mental health, Steamwhistle beer, beer regulations, Ontario agriculture (with Steve McCabe), Grain Farmers of Ontario update (with Barry Senft, CEO). Hosted by Maegan MacKimmie and Rachel Telford.